Zum 35 jährigen bestehen des OV B12 Hersbruck wurde uns das Call DA35HEB bis 31.12.2011 zugeteilt. Wir sind der lokale Club des DARC, das ist der Deutsche Amateur Radio Club. Unser Standort liegt ca. 30km östlich von Nürnberg, in Süddeutschland bzw. Nordbayern, also Franken im Locatorfeld JN59rm. Unser Ortsverband hat derzeit 39 Mitglieder und jedes unserer Mitglieder konnte das Call benutzen, deswegen konnte der Standort variieren. Vielen Dank für das rege Interesse an dem Sondercall. Jedes QSO wird mit QSL-Karte über das Büro bestätigt. Bitte schickt eure Karten auch über das Büro. Unten könnt ihr unsere QSL-Karte schon mal sehen. 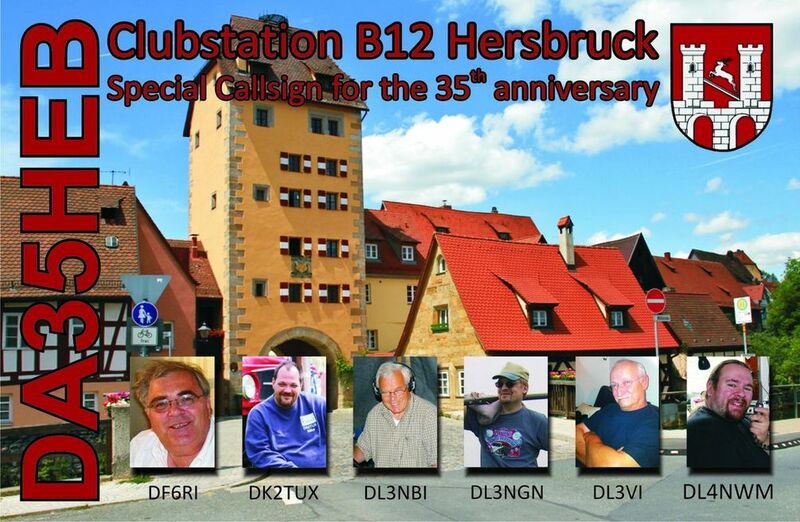 For the 35th anniversary of our hamradio club B12 Hersbruck we got the call DA35HEB. It is valid untill 31.12.2011. We are the local club of the DARC, the German Amateur Radio Club. The location is aprox. 30km east of Nuernberg, in the southern part of Germany. LOC: JN59rm. Our Club has 39 mebers at the moment and each member was able to use the special call at her/his home location, so the locator may vary. Many thanks for the big interest for our special callsign. All QSO's will be confirmed with an QSL card only via the bureau. Please send your card also only via the bureau. Below you'll find our QSL card.